HILE JOSIAH WAS the king in Judah, God called a young man named Jeremiah to be a prophet. At first Jeremiah thought he could never obey his call, for he was a shy, timid young man. He told the Lord that he could not speak to the people because he was only a child. But God answered, "Do not say you are only a child; for you must go to every person to whom I send you, and you must tell them every word I bid you." Then the Lord touched Jeremiah's mouth and said, "I have put my words in your mouth, and I have set you over the nation to do a great work for me." Jeremiah was no long afraid to obey when God promised to be with him and help him out of his troubles. For Jeremiah knew he would have many troubles. He knew how the prophets before him had been cruelly treated because they dared to speak God's words to the sinful people. He knew that he, too might have to suffer many things. 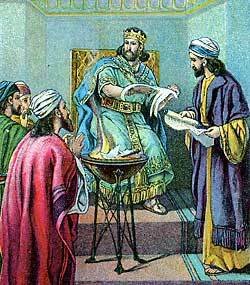 While Josiah was king in Judah, Jeremiah was treated kindly. But after Josiah died the people soon turned back to idol-worship again. They did not care for the true God, and they refused to listen to his faithful prophet. The king of Egypt took their new king away as a prisoner, and made them pay great sums of money every year. Then he placed another of Josiah's sons upon the throne of Judah. Josiah's sons were not good men like their father. They forsook God and allowed idols to be set up all through the land. They even treated God's prophet unkindly because he warned them about the dangers that God would send upon them as punishments for their sins. One day Jeremiah told his dear friend Baruch the words that God spoke to him, and Baruch wrote the words in a book. Then he took the book and went out to read it among the people. Soon the princes of Judah heard about it, and they called Baruch and asked him to read to them. They were frightened when they heard what Baruch had written; for they believed God's words, and they knew their land would soon be taken away from them. They asked Baruch to let them have the book to read to the King. But first they told Baruch to hide himself and Jeremiah, lest the King be angry when he hear the words of God and try to punish them for putting the words into the book. Jehoiakim, Josiah's son, was the king at that time. He was sitting in his palace when the princes came to him, bringing the book that Baruch had written. And he listened while they read. But as soon as they finished reading a page he called for the book and took his penknife and cut the page out. Then he threw it into the fire. This he did with every page that Baruch had written. He would not believe the words of the Lord. And he wanted to punish Jeremiah and his friend; but he could not find them. The princes sent word to Jeremiah and Baruch, telling them how the King had treated the book, and once more the prophet and his friend wrote down the words of God. And the words that they wrote were true; for not long afterwards a great king from the east country, of Chaldea, came and took some of the people away to Babylon And Jehoiakim was placed in a prison-house and kept for a prisoner as long as he lived. But Jeremiah's troubles were by no means ended. After the death of Jehoiachin, son of Jehoiakim, who had reigned just a little over three months, a new king, Zedekiah, another son of wicked Jehoiakim, was soon ruling the people of Judah, and he was more wicked than his father had been. He caused Jeremiah to be cast into a prison-house because he spoke the words of God. And the men who put him into the prison tied ropes about his waist and lowered him into a deep hole beneath the prison floor. Such a hole is called a dungeon, and there the prophet was kept for some time. In the dark, dreary dungeon Jeremiah was very unhappy. He had no comfortable place to rest, and he had only dry bread and water to eat and drink day after day. While this trouble was happening to Jeremiah, the people of Jerusalem were also in distress. The king of Babylon had come again, with a strong army, and was camping around the walls of their city. They could not go away, and none of their friends could come to help them. And their food-supply was growing smaller every day. Soon they would have nothing left to eat. The King of Judah was afraid of this army outside his city. He called for Jeremiah to tell him what to do. So the men let ropes down into the dungeon and pulled the prophet out again to send him to the King. And Jeremiah told the King that God was going to allow the army to capture the city and break down its walls and even destroy the beautiful temple of the Lord. But he said that God would not let the Chaldean king, Nebuchadnezzar, kill the people of Jerusalem if they would willingly offer themselves to become his prisoners. Then they would not need to starve to death inside the city. Jeremiah asked the King not to send him back into that dark dungeon again. So afterwards he was kept in the court of the prison, and treated more kindly. But he was not allowed to go about through the city and talk to the people. The people of Jerusalem and their King were not willing to give themselves up as prisoners to Nebuchadnezzar, as Jeremiah had told them to do. So weary months passed by, and they stayed inside the walls of Jerusalem and suffered from hunger and thirst. Jeremiah suffered with them, for he could not escape. At last, when all the food was gone, the King decided to slip away from Jerusalem during the night. He thought the Chaldean army and King Nebuchadnezzar might not see him. But King Zedekiah had not gone far from the city when he was captured by his enemies, the Chaldeans. They put heavy chains on his hands and feet, and then put out his eyes and led him away to Babylon. Many of the people of Judah were taken with him, and only a few of the poorer people were left in the land. Nebuchadnezzar and his army broke down the walls of Jerusalem and set fire to the temple of the Lord. They first took out all the vessels of gold and silver that they found in the temple, and carried those precious vessels to their own land. Jeremiah was allowed to remain in the land of Judah among the poorer people. And he lived to be an old man. But as long as he lived he faithfully warned the people according to all the words that God spoke to him. Because he lived during such a time of trouble, Jeremiah was a sad-face man. He talked more about the sorrows of his people than about their joys. And often he wept because of their sins. For this reason he was called the "Weeping Prophet."